This is why I bought a Kindle and not a Nook—Amazon has it together as a company, a lot like Apple but without quite the same visual panache. 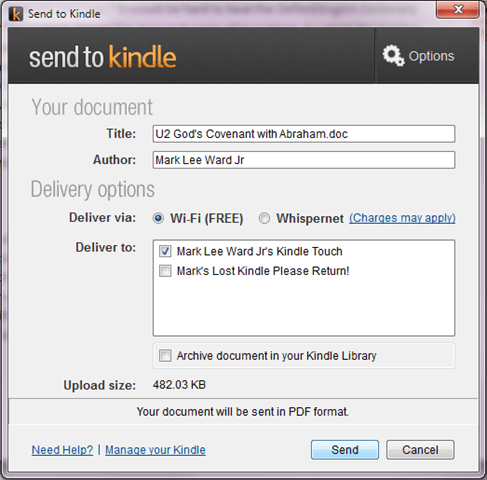 I can now more easily send any document on my computer straight to my Kindle. That’s real handy for someone like me who likes the ergonomics of the Kindle better than those of a laptop or desktop. The root meaning of “ergonomic” has something to do with “lying on a couch,” I think, and that’s why I like my Kindle. Now, Amazon, please develop this for the Mac! I’m afraid this screen reveals to careful readers that I have lost one Kindle… =( I took it on church visitation and never saw it again. No one has deregistered it, so I hope they’re reading the Bible… But I suspect it’s just languishing somewhere. I have prayed often that it would find its way back to me. 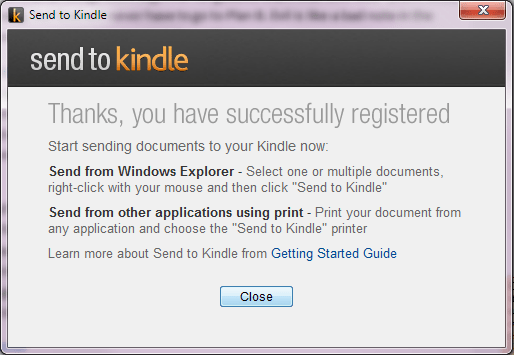 =( One small blessing is that Kindles have gone way down in price since I bought the one I lost. Mark, this is very handy. I found it about a week ago and am trying it out alongside Instapaper and Evernote.